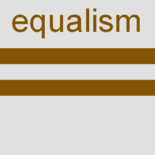 On this equalism blog, we tend to duck out of the big politics of equalism and inequality. It’s just too tricky for us. Plus we don’t fancy getting caught up in social media wars! We focus more on local scenarios and challenges. They’re tough enough anyway. Compare, if you want, c. j. macq’s very different take on equalism. His aim is political – to persuade people of other political persuasions to turn to equalism instead. In this post, we now do venture into the political sphere to share with you a rather old contribution to the subject of equalism and politics. You’d think there’d be little value in a resource that is 70 years old. But here from post-war 1945-6 – via the Open Minds Foundation blog and Brain Pickings – are two old Encyclopaedia Britanica archive films about Democracy and Despotism. The first film (1945) explores how Democracy rests in Shared Respect and Shared Power. These need conditions of Economic Balance and Enlightenment. The equalist sentiments are there. But it is noticeable to a modern eye that, though women are sometimes in the picture, the commentary is gendered as would be typical then. There is reference to other equalities, but the film doesn’t refer to gender equality. And the scenes where elected representatives debate seem to be all male bastions. Again, that’s probably accurate for then! The second film (1946) shows how to tell and shape the difference between the two – democracy and despotism. You can imagine in 1946 why people were concerned to avoid countries going the way of totalitarian states like Nazi Germany. There’s no reference at that time to the despotism of the Soviet Union. The films are non-partisan, but the American project would be to promote its core value of democracy across the world. Yes yes, we know, that that project has often left a lot to be desired in their own despotic methods! These two films are wonderful ten-minute versions of the kind of thing you’d find proliferating now on YouTube and Wikipedia. There’s lots in these old films that is still very relevant. They use simple scales for the viewer to rate their countries on how they function. For Despotism, you’re invited to rate a country on scales of Information and Economic Distribution that lead to a rating on Respect and Power and finally to a rating on Democracy versus Despotism. The mirroring of despotic patterns in (old-fashioned) teacher training and then in the teacher’s school classroom is shown finally transferring back to the child’s family home. It’s nicely done. Raising critical thinking and awareness so children of all ages can spot and stop totalitarian ways, whether at state or personal levels, is still a major challenge. What is naturally missing from this old film – made following the outright violence, death and devastation of a physical world war – is the subtler despotism that can overtake societies without the visible bloodshed. That subtle despotism is political correctness – the hope of one group to gain power and impose their well-intended views on the rest without really engaged discussion and persuasion. Mind you, that kind of subtle despotism has also been long foreseen by thinkers through the ages. For example, by JS Mill in On Liberty who described ‘the tyranny of the majority’. People now see the electoral evidence of the rebellion against that kind of tyranny in recent referendums and elections. At least we can be thankful the bloodshed remains ‘virtual’ with democratic battles. But for two ten-minutes’s of non-partisan, balanced and clearly-presented education, these little films on ‘Democracy’ and ‘Despotism’ really cannot be improved on. This entry was posted on 6 December 2016 by Nick Child in Culture, Education, Equalism in general.